Are you looking to find the best backed horses today? Are you looking to follow the money, with your bets? Read on to find out how you can do this. When you are looking to find the best backed horses, you need to first decide what this means, exactly. Are you looking for the horses that are being backed by the most people, or the runners that are attracting the most money? Before we explain in more detail the best backed runners today, there is an easy way to find out, thanks to RaceBets. The distinction is critical. If 10,000 punters each bet £10 on a horse, the total wagered is £100,000. But if 6 big-time gamblers each stake £20,000 on the same horse (and nobody else backs it), then £120,000 will have been bet on it – a larger amount. Let’s start with the first scenario and look at how you can find the horses that most people are backing. No figures will be available for this, but you can make a reasonable decision based on which horses that the most-famous tipsters have predicted will win. The biggest and most obvious is Templegate, from The Sun newspaper. His real name is Steve Jones and he is by far the biggest name when it comes to tipping horses. The next biggest is Robin Goodfellow, from the Daily Mail. The Mail now outsells The Sun and their website also gets more traffic. However, The Sun has more readers that are interested in racing. Robin Goodfellow (Sam Turner) still enjoys a huge readership though and if he has tipped a horse then plenty will be putting their money on it. Greg Wood of The Guardian is next on the list. The Guardian is a broadsheet newspaper, which now has established itself as one of the world’s biggest and most-visited websites. Templegate, Robin Goodfellow and Greg Wood provide a free tip for every horse race that takes place in the UK, on any given day. So how can you make use of this? Quite simply by checking their daily selections, here on EveryTip, each day. Look for when all 3 tipsters have selected the same horse for any race. You can be sure that this horse will be backed by an enormous number of bettors. It is highly-likely that the price on these horses will shorten, in the hours that lead up to the race getting underway. You will usually find that all of their tips are published on EveryTip, before 9am (UK time). It’s vital that you get your bets on early and that you back the horse with a bookmaker that is offering Best Odds Guaranteed. This means that you are guaranteed to get the best price, regardless of market moves. Even when all 3 tipsters have selected the same horse, the price can drift if big money comes in for another runner. So if you back the horse at 3/1 and it drifts to 5/1 before the off then you will be paid-out at 5/1 – but only if the bookie offers Best Odds Guaranteed. Should the horse get shorter in price, you will be paid out at the odds you took so Best Odds Guaranteed gives you a much higher chance of being a winning punter. Now let’s take a look at the other scenario – when you want to find the horses that are being backed with the most money. Go to Bet365 and in their sportsbook section, click on ‘Horse Racing’ and scroll down to the upcoming races. When you open a race-card, you will see the current fixed-odds price along with all of the prices each horse has been since the opening shows. Some horses may well remain at exactly the same price, particularly if you are checking early. Look for the horses that are showing the biggest downward price trends. This shows that these horses are being backed and there is a very good chance that the price will continue to fall. Of course, you can never be sure of this though. Big bets could come in, just before the race starts. These wagers are likely to completely disrupt the market, so it is vital that you are backing the horse with Best Odds Guaranteed. Bet365 offers this on all UK and Ireland contests. 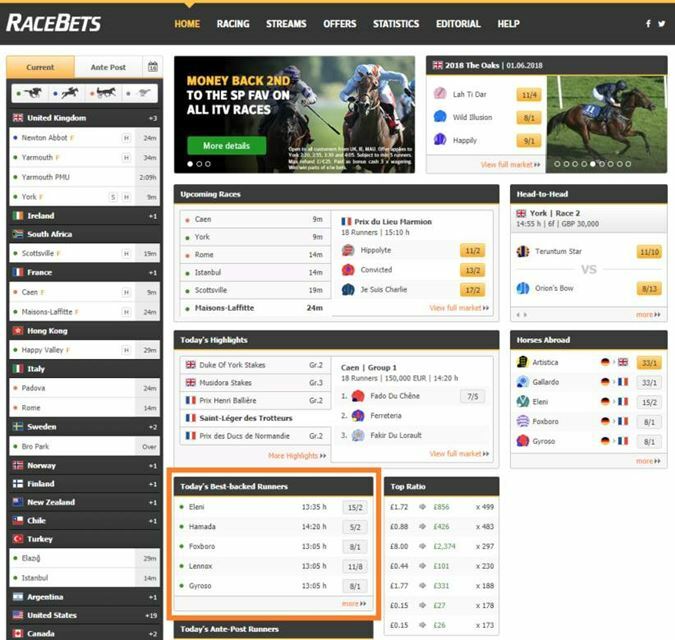 You can also use a betting exchange to track market moves and there is none better than Betfair, when it comes to horse racing. Here you will be able to view just how much money is being bet and laid, on each horse. For those of you who didn’t already know, Betfair offers peer-to-peer betting. You are not making bets with a standard bookmaker. Betfair allows you to make bets with other users, or take their bets. The exchange charges a small commission on each transaction. EveryTip is among the biggest free sports betting tipster websites and you can be sure that any horses that are tipped on this website will be being backed by a lot of people – online, in the betting shops and at the track. The site was first launched in 2013 and has grown to the extent that now millions of visitors access our content, every year. Our site is updated every single day, including Xmas and the new year period. As well as tips for UK races, you will also find predictions for the action taking place in Ireland, South Africa, Hong Kong, Singapore, Malaysia, Macau (China), United Arab Emirates and India. Our football, cricket, greyhound and tennis tip pages are also updated daily. On Saturday’s additional pages are updated, to get you well prepared for the big races that always take place on that day. There will be predictions from Matt Chapman, Seymour Biz and winner/runner-up selections for all ITV Racing encounters and for the Tote Scoop6. Our golf, darts, snooker and rugby betting tips are updated on this day only. We’ll continue to grow the site and it will always be entirely free to use. No membership is required, although you can choose to subscribe to our daily email which includes tips for horse racing, football, cricket and greyhounds. Add EveryTip to your favourites and visit us each morning, before making your bets!